Oh, how I LOVE these little cuties! 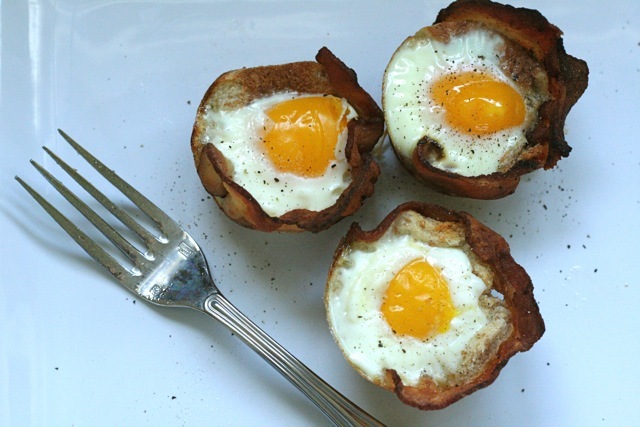 What an ingenious idea – bacon, eggs and toast all wrapped up in a cute little muffin-sized package. Even better, these take next to no time to throw together so they are perfect for a lazy weekend breakfast, or a quick breakfast-for-dinner night. Growing up my absolute favorite breakfast was known in my family as an “eggy on toasty” (an over-easy fried egg on a piece of toast), even better when made by my sweet Grampa. These remind me so much of that favorite dish, and I hope that one day these will be a favorite breakfast of one of our kids. These are much more ideal than regular fried eggs to serve a whole family because you can make so many at a time, rather than having to cook eggs in batches. If you don’t like a runny yolk, simply bake your eggs longer until they are cooked to your preferred doneness. Preheat the oven to 400° F. Grease 6 wells of a muffin pan with butter. In a frying pan, cook bacon about 3-5 minutes, until partially cooked but not completely crispy. Transfer to a paper towel-lined plate. Cut out rounds of bread (I used a 3.5-inch round cookie cutter, but a drinking glass would be fine.) Press the bread rounds into the greased muffin wells. Curl a piece of bacon around the periphery of each piece of bread, positioning it between the bread and the muffin tin to help keep it in position. Sprinkle a small amount of shredded cheese in the center of each piece of bread. One at a time, crack an egg, removing about half of the white, and dropping the remaining white and yolk over each piece of bread, being careful not to break the yolks. Once all the bread pieces have been topped with eggs, bake until eggs are cooked through to your liking (about 6-10 minutes) and bacon is crispy. Run a knife around the edge of each muffin well and pop the egg cups out. Season with salt and pepper to taste and serve immediately.